Double your fun by creating two Cat's Cradle XL units from each set of squares and rectangles. Trim the blocks with the Cat's Cradle XL Tool to create perfect triangle blocks without ever cutting a single triangle! 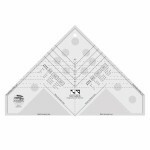 Create 8 different sizes, ranging from 4.5" to 8" finished - the cutting requirements for each is printed right on the ruler!